The BatteryClip is a unique battery storage solution that follows the form and function of an ammunition clip. Capable of holding up to ten batteries, the BatteryClip was developed by Chip Hogg to provide professionals in the film and television industry a convenient method of storing and dispensing batteries. 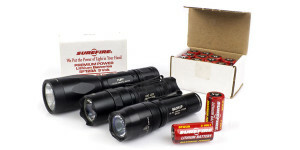 Three different models of this Made in USA product are available for AA (10 cell capacity), 9-volt (8 cell capacity), and CR123A (8 cell capacity) batteries. The CR123A BatteryClip, available in Coyote Brown or Foliage Green, has a Manufacturer’s Suggested Retail Price of $24.95. The CR123A BatteryClip features a smooth design to minimize the possibility of snagging when carried in a pocket or pouch. Constructed of a rigid polymer, the outer case measures 8.5″x1.6″x0.9″ and has quantity indicators molded into the back of the case. Batteries are fed into the clip from the rear at a 45 degree angle. Once inserted, the spring tension locks the top battery into place and prevents it from falling out the back of the clip. The top battery is pushed slightly above the front opening preventing the battery from being dispensed unless the stack is pushed slightly downward. When loaded with a full complement of eight CR123A cells, the BatteryClip weighs in at 8 ounces (228 grams). Cells can be dispensed with the thumb or forefinger by pressing the top cell slightly down and forward. I’m always looking for a better way to keep up with spare batteries and when I saw the BatteryClip I had to give it a try. So far it has met all my expectations and the ease with which it fits into a pouch or pocket greatly adds to its usefulness. Loading the BatteryClip is fairly easy and straightforward. The spring provides plenty of tension to keep the batteries in place and requires a little bit of extra effort to load the last couple into the clip. Although it is designed for one-handed loading from the rear, some may find it easier to use both hands and load from the front. Even when fully loaded, the case shows no signs of stress or deformation and there is absolutely no battery rattle. Dispensing of batteries couldn’t be any easier and is one of the main advantages the BatteryClip has over most other battery cases or holders. The BatteryClip is ready for use as soon as it is picked up, without having to be opened or otherwise manipulated. However, this ease of access does come at the expense of weather protection for the batteries. Visit TheBatteryClip.com for more information about this product. The sample used in this review was purchased from NiteMods.com. 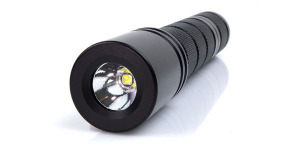 Posted in Flashlight Accessories, Flashlight Reviews and tagged Flashlight Accessories. I probably never would’ve known about this product if it weren’t for this review and, as such, I’ve got one on order (coyote brown, CR123). Thanks FG!